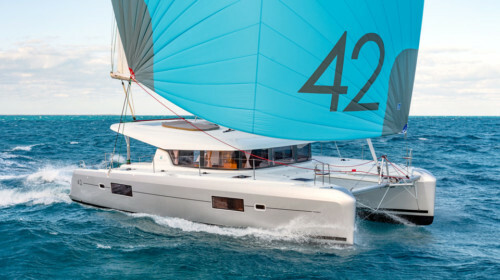 This Lagoon 560 is available for private yacht charter in Phuket. Lagoon 560 Charter Phuket with Boat in the Bay. The Lagoon 560 has been ergonomically designed to provide both style and comfort in order to make your holiday a truly memorable experience. The beautiful fly-bridge lounge area, spacious cockpit, aft-deck and forward trampoline area offer multiple options for lounging. Her interior decor is contemporary and light, featuring beautiful neutral fabrics and warm woods. The very modern and spacious living room easily converts into a big air-conditioned dining area with a large sofa and 2 low tables. With 4 staterooms the Lagoon 560 can accommodate up to 8 charter guests in 4 spacious cabins, each with private en-suite facilities and individual AC controls. The 5th cabin is crew quarters. The Lagoon 560 has 4 qualified crew on board ensuring proficient service. The captain has been apprised with excellent reviews for his fun welcoming personality and enthusiasm to deliver dream holidays by unveiling the most exotic cruising ground in the world. He has worked as Charter Skipper in the Andaman Sea for over 6 years and has sailed in Thailand, Burma, Malaysia, and the Andaman Islands. 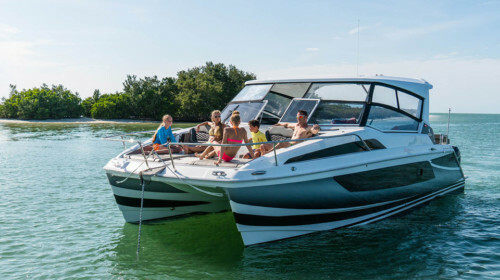 The choice of toys on this boat is fantastic: water ski, wakeboard, 2 kayaks, towable buoy, snorkeling and diving equipment, as well as fishing equipment. Contact Boat in the Bay today to inquire about Lagoon 560 Charter Phuket and Myanmar. Charters longer than 24 hours are operated under MYBA (Mediterranean Yacht Brokers Association) terms. The price includes the yacht and her crew, use of all onboard amenities and the boat tender, bath and beach towels, bed linen, end cleaning. Charters longer than 24 hours are operated under MYBA (Mediterranean Yacht Brokers Association) terms. The price excludes alcoholic beverages, land transfers, hire of dive instructor (mandatory for diving), fuel for tender for extended water sports or explorations, fuel for the main engine if exceeding 4 hours, border fees/visa expenses in Myanmar, and crew gratuities. Advance Provisioning Allowance to cover these costs in the amount of 5% of the total charter fee is collected 2 weeks before departure.